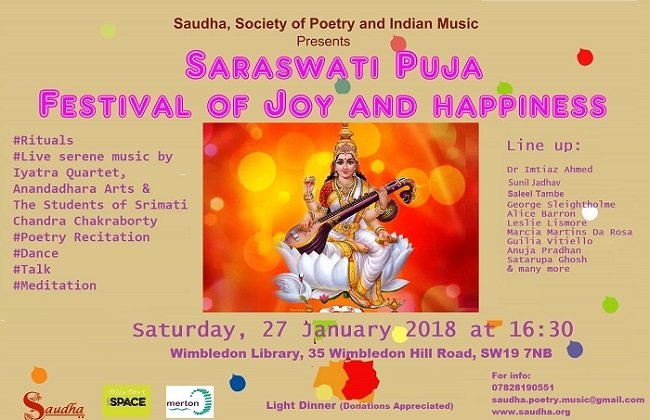 Saudha (www.saudha.org) celebrates this auspicious moments of worship for the goddess of arts and knowledge Devi Sarswati through the captivating sessions of poetry by the local Merton poets, dance and devotional music (both classical and semi-classical) by a selection of prominent singers and musicians. This festival of devotional music and arts is curated by one of the finest classical vocalists in Europe Chandra Chakraborty. The event will strat at 4.30pm and dinner will be served after performances.